When you're deaf or hard of hearing you can often find yourself wondering what it would be like to be able to hear. Yet, there are also times when you're glad to be deaf! Think of all the arguments you're missing out on. You also don't have to listen to all the noises of a busy city or that thunderstorm that wakes people up at night. Sure, there are obstacles to being deaf, but when it's a reality we have to look on the bright side, too. Let's explore some of the things people enjoy about not being able to hear. Many of these require a sense of humor and that's the point. Hearing people are subjected to all sorts of background noise in their day-to-day lives. From cars honking on the street to your neighbor's loud music or that dog who won't stop barking, there's plenty of noise to that you won't miss by being deaf. This is particularly true if you live in an urban area or apartment complex. There are some situations in which deaf people are especially thankful they can't hear. Public restrooms and screaming kids are two perfect examples in which those who can hear probably wish they couldn't. Kids are particularly fond of their ability to not hear what their parents are saying. When their mother asks them to take out the garbage, they can always fall back on the excuse that they didn't hear it. This can be frustrating for parents, of course, but deaf children do seem to have a bit of fun with this game. Likewise, if you're in a hearing-deaf relationship there are some advantages to not hearing the other person. An argument can end much quicker if one person can't hear, right? And don't even get us started on the inability to hear your snoring partner in bed! That in itself leads to many restful nights. Joking aside, it's still important to communicate with your family. Using your deafness as an excuse all the time can lead to bigger problems. Sure, there are conversations you may be missing because you're deaf, but there are also plenty you're probably happy to miss out on. Some people have no desire to talk about gossip and other drama that creeps into everyday conversation, yet these can happen at any time or any place. Many deaf people are often grateful that they cannot hear these things. Similarly, as a deaf person you get to "miss out" on listening to politicians goes on and on, you don't have to partake in mundane conversations, and you have an excuse to stay out of debates. Yes, you can take part in these things if you like, but there is an advantage to being able to ignore a long-winded talker. Observing people is quite fun and a number of deaf people get a kick out of people watching. When you can't hear little sounds or random talking, it makes the actions of other people just a little more humorous. This is not to say that you're making fun of people. Instead, with the absence of sound, small things can take on a whole new meaning. For instance, if your husband suddenly twists around, flailing his arms like a wild man, you might not know that he was just stung by a bee. Actions like that can be quite hilarious when taken out of context. Even in the age of cell phones, unwanted marketing calls are a nuisance for many people. If you're hard of hearing, you can always use the honest excuse that you can't hear those annoying salespeople. It's not a complete lie, right? You do have to be careful about your "selective hearing" though. Not doing what your boss asked because you didn't "hear" it can get you in a bit of trouble, so try not to take this too far. There is a certain peace that can be found when you can't hear. Many deaf people who use hearing aids admit to turning them off when they just want to escape whatever's around them. Television or kids too much for you? You can literally tune them out. This also appeals to a more spiritual or thoughtful side of life. When you need a few minutes alone to think, pray, or meditate, it's much easier to do when you cannot hear what's around you. It seems a bit odd that some people feel their deafness can make them a better listener, but it's true. If you think about listening as a communication tool rather than a strictly auditory experience, you can see their point. Hearing people can take listening for granted, deaf people tend to listen with more intent out of necessity. Reading lips and sign language, understanding body language, or having to concentrate harder to pick up sounds can make you more attentive. This, in turn, can help you comprehend what is being said and respond with more thought. Deaf pride is real and the deaf community is filled with a variety of people who are genuinely proud to be deaf. This bond between people who cannot hear is something you don't often find among those who can. Not every deaf person is nice and genuine, of course, but many are and the community is very supportive. Whether you were born deaf or are experiencing hearing loss, it is possible to find others who share your experiences. The deaf community is also vibrant, filled with art, culture, and other fun activities that just wouldn't be the same if everyone could hear. If nothing else, you can be glad that you're not alone. Is Deafness a Disability or Cultural Minority? 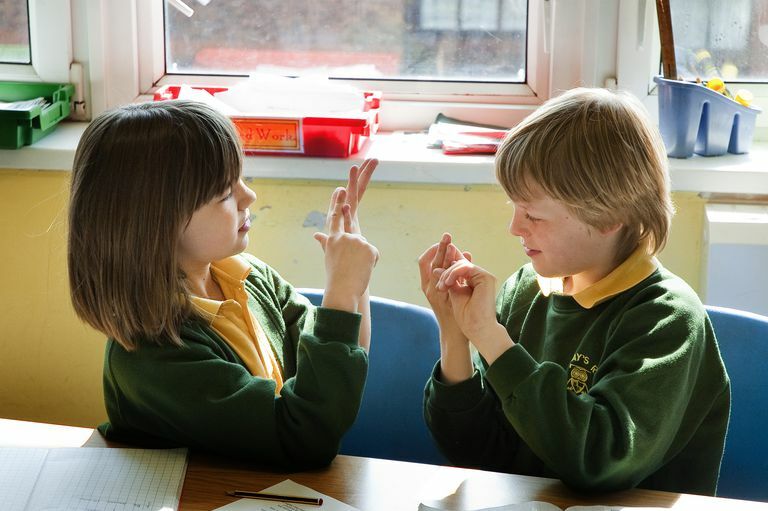 What Challenges Still Exist for the Deaf Cmmunity?